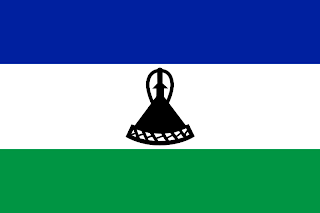 In 1966, Lesotho gained its independence from Britain to become a Monarchy, headed by King Moshoeshoe II. His role was largely ceremonial, with most of the power in the hands of the Prime Minister. 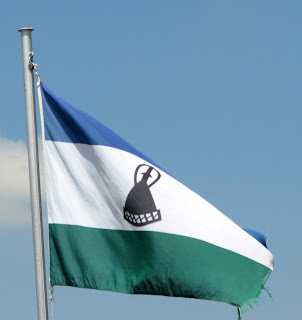 The first flag for the newly independent nation was a blue field, on which is a white Makorotlo (a Basotho hat). On the hoist of the flag are two stripes of green and red. 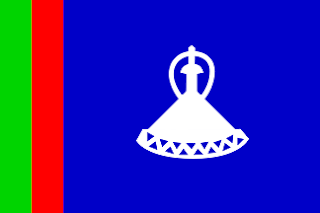 The green represents the land, the red represents faith, the blue represents the sky, and the white in the hat represents peace. Following a military coup in 1986, the king was handed more power. However, following a memorandum demanding more powers, he was forced into exile, and in 1987, a new flag was instituted. Created by Sergeant Retselisitoe Matete, it featured 3 colours, white, blue, and green. The flag itself was split white and green, with a blue stripe dividing the two colours, running diagonally from lower hoist, to upper fly. The white represents peace, the blue represents the rain, and the green represents prosperity. 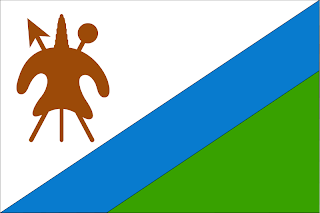 In the upper hoist, is a light brown Basotho shield, with an assegai (spear) and knobkierie (club) behind it. The military ended its rule in 1991, but Lesotho entered into a period of uncertainty, with coup and counter-coup taking place, until Botswana and South Africa sent in troops to help stabilise the nation. Whilst Botswanan troops where welcomed, the South Africans where not. Causing riots when they raised the South African flag over the Royal Palace. Finally, in 2006, with a new government, and new constitution, a new flag was agreed. This time, a horizontal tricolour of blue, white, and green. In the centre, a black Makorotlo. The blue stands for the sky, the white for peace, and green for prosperity. Same as the first flag. However ,the hat is now black, to represent the black majority of the nation.